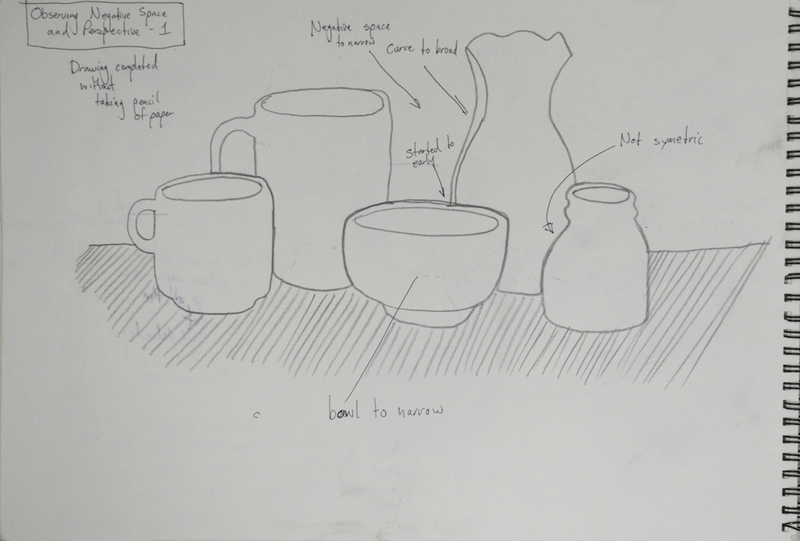 This exercise of observing negative space and perspective involved following the silhouette of a group of objects that shared similar elements with a soft drawing tool such as soft pencil without taking it off the paper. 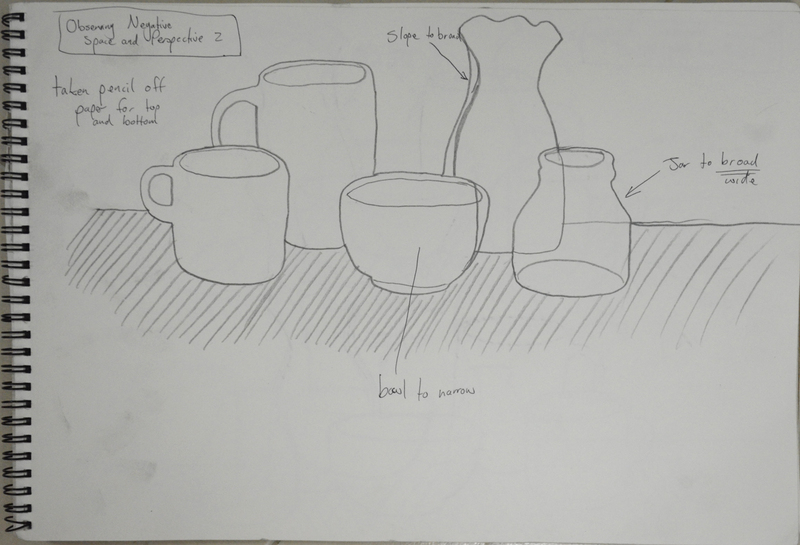 I drew in from the left using the furthest edge of the table as a starting point and followed the upper silhouette of the objects carefully assessing the silhouette and proportions of each object and changing the direction of the line as the silhouette of one object impacted off another. Then I went back to my original starting point and followed the line until it reached the first object again then followed the bottom silhouette of the objects following the same steps as the top half. When the bottom half of the silhouette was complete I went back and drew in the details of the objects themselves. I used a 6B pencil for this exercise as I am still waiting for Derwent to send me replacements for my 7, 8 and 9B. I found the exercise quite difficult and frankly one that I should keep having ago at from time to time. I made a few attempts without taking my pencil off the paper and I was actually very surprised when I drew the bottom silhouette and the objects looked something similar to what they did in my composition. There were a few errors in each of my attempts, vase to wide (starting to draw it too early and the bowl to narrow and the jar on the right hand side was quite wonky in each of my attempts, but the negative space between each object was the correct shape just not always the right size. Like I said earlier it is an exercise that I think I will gain a lot from and should practice from time to time, I also like the way that I arranged the objects and would like to do a similar still life using a similar composition, this exercise maybe a great starting point for that still life. Do you think it is easier to suggest three dimensions on man-made or natural objects? This project has taught me that it is easier to suggest three dimensions on man-made objects rather than natural objects. Man-made objects are usually made up of geometrical shapes such as cylinders, cones or cubes and so the lines of man-made objects are easier to draw and suggest their 3D form using most mediums. The irregular shapes of natural objects means that their three dimensional features are much more subtle with lines that are more difficult to depict and draw. 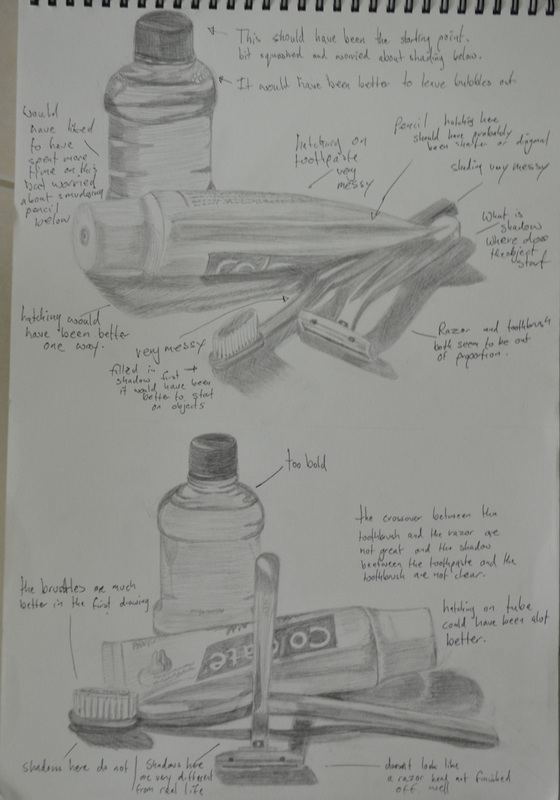 In the exercise ‘Still Life Sketches of Made Objects’ I created a sense of solidity by using various hatching techniques and swapping between pencils of different hardness mainly B, HB and 2B, shadows and tone also played a big part in making the objects look solid. In the exercise ‘Composition of Natural Objects‘ working with watercolor pencil I used hatching and layers of darker colour to show solidity. Do you think changing the arrangement of your composition makes a difference to the way you create a sense of form? Changing the arrangement of the objects changed the way each objects interacted with each other, shadows and light reflected off one object to another and other objects in the composition (such as the plate in image 2) can play a major role in creating a sense of form. 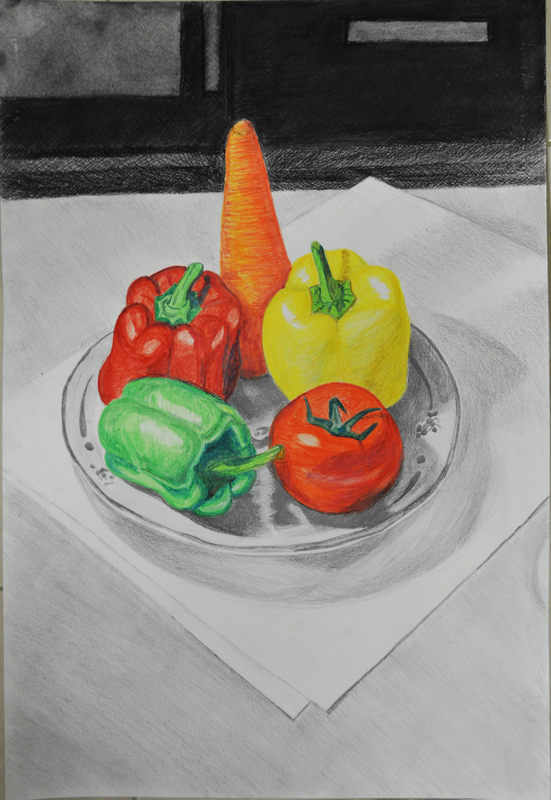 For the second exercise I decided to position myself slightly above looking down at the objects so I could see the full form of the the objects and shadows interacting with each other in the middle of the composition, I thought this would help me to create a sense of form in my drawing. A bruised rib from a an accident the day before helped me to reinforce this decision. 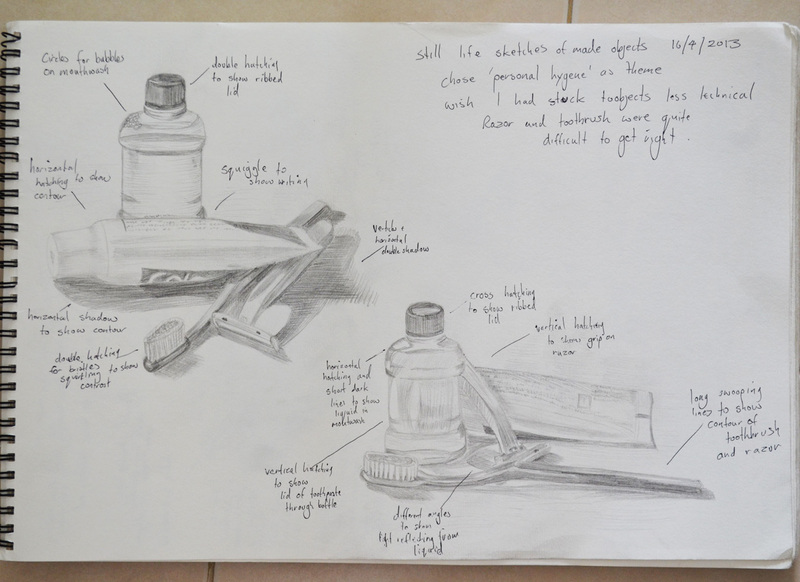 I found making quick sketches of the natural objects a lot easier than making thumbnail sketches of ‘made objects‘ in the previous exercise and started out with a good feeling that the exercise would go well. 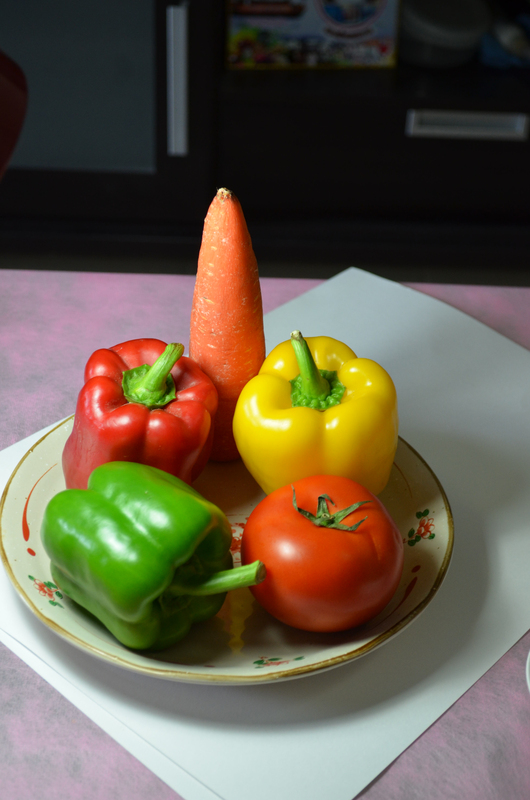 I chose vegetables for my composition which were a red yellow and green capsicum, a tomato and a carrot. I thought about the best place to position myself in relation to the objects and positioned myself slightly above. This was also more comfortable as I had bruised a rib after a fall during the Thai new year festivities (Songkran) a couple of days before, so I propped myself up with a couple of pillows, I couldn’t complain though as it did give me a good view of all the vegetables. As always due to doing most of my work over different times of day and especially in the evening I worked with a bendy light as a light source, making sure it cast adequate light and shade onto the still life. I wanted to get more practice with watercolor pencils and so I initially chose to do this exercise completely in watercolor pencil and so the only size sheets I had were A3 which I bought for the ‘Supermarket Shop’ exercise. However the problem was the composition I chose meant that I had to use the paper length ways but I wanted to get the whole of the plate into the finished drawing with the shadow that it cast and so I knew in advance it would leave a lot of negative space on the paper. Placing another folded sheet of paper under the composition helped me fill up the negative space and I decided that I would also use the TV unit in the background as the background. I made a very poor first attempt at the still life completely in watercolor pencil, it set me back a good few hours and did not put me in the best of moods but did teach me some valuable lessons. I did not have enough practice with this medium to get it perfect. Blending colours with this medium was more difficult than I thought. You can’t erase watercolor pencil once it’s in paint form and if you try there’s a risk of ripping the paper! 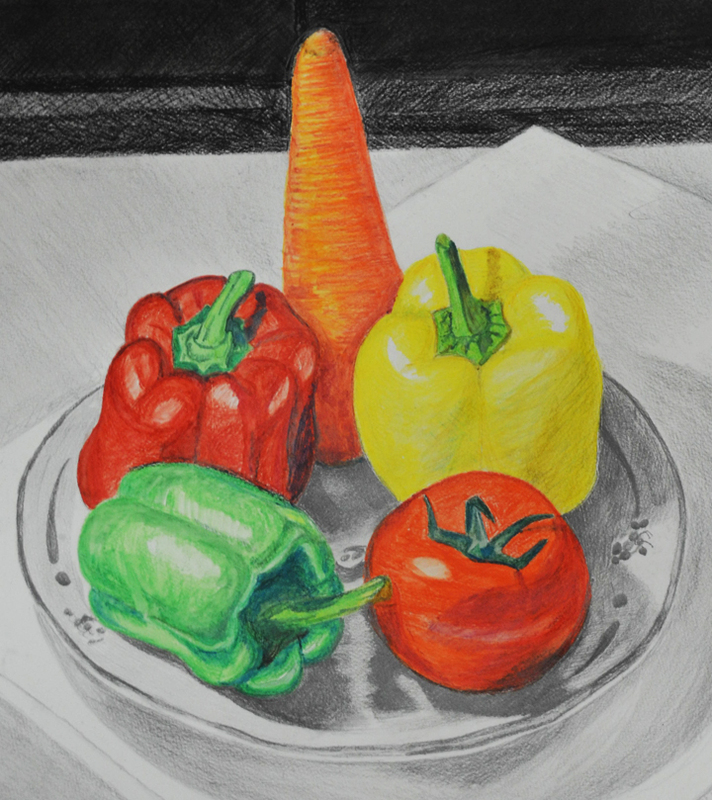 I decided that my next attempt at this exercise would be a great chance to produce my first mix medium drawing and if I couldn’t perfect the colour, shadow and light of the vegetables I would do my best and then really make the composition stand out by the drawing everything else in graphite pencil. 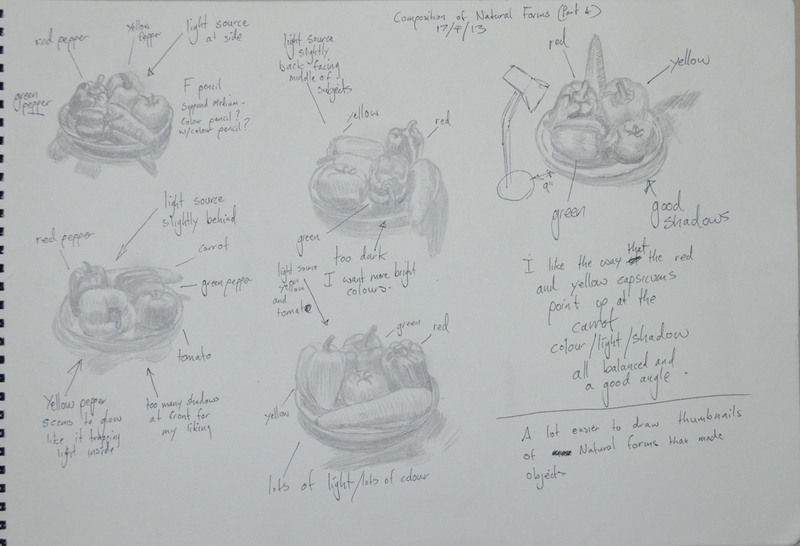 On my first attempt at this exercise I started out sketching the dark parts of the vegetables in watercolor pencil first but on the second attempt I started with the lighter colours, although the second attempt was easier and looked better I have yet to perfect my technique. When it to the lighter shadows in the drawing I took it very slow, using the pencil very lightly and holding it at the end and letting it almost dangle, only occasionally did I have to resort to blending with my finger. For the darker shadows on the plate I used 4B and 8B pencil. All was going well until it came to the background objects, my 7B, 8B and 9B pencil kept snapping so after an email to Derwent to complain about the quality of pencils in their 24 graphite pack I continued with an EE pencil. I found the EE pencil no replacement for the 9B pencil and was hard to produce different tones so I finished the background off in Conté pencil and charcoal. I was a bit disheartened at times after starting off so well, especially having discovered that I drew the composition in my second try on the the wrong side of the paper thinking they were the same. Luckily enough it turned out to my advantage as it was easier to draw in graphite and the paper did not warp as much when wet plus the colours seemed to be a lot brighter when they bled. I was also a bit upset that I had to use more than two mediums in this drawing and found it frustrating when things kept breaking. The end result of the watercolor pencils is not what I had in mind but I thought the contrast between the colour and the graphite pencil was excellent. The good news is Derwent did get back to me and admitted there was a problem with the old batch of graphic pencils and are sending me replacement 7B, 8B and 9B pencils.